Pace Scheduler | Scheduling, Simplified. By using the features of Pace Scheduler, you are painting a gradually more complete picture of what's happening at your department. Once you've done the work of adding people's schedules and beat & inventory assignments, we have a few features tailored to managing a day at a time. On the home page of the application, admins and users alike can see everything that has been planned for the day at a glance. Everyone's start and end times, beat/post & inventory assignments, as well as any notes for that day are all clearly displayed. This page is also exportable into a sign-in sheet PDF format. Our Message Blast feature allows you to target any individual or group of employee(s) at your department. You can choose to send the message as an email or a text message that will automatically go out to all of them. You can also set up templates for messages that you send frequently, and each message sent is tracked for you to then get an audit log. 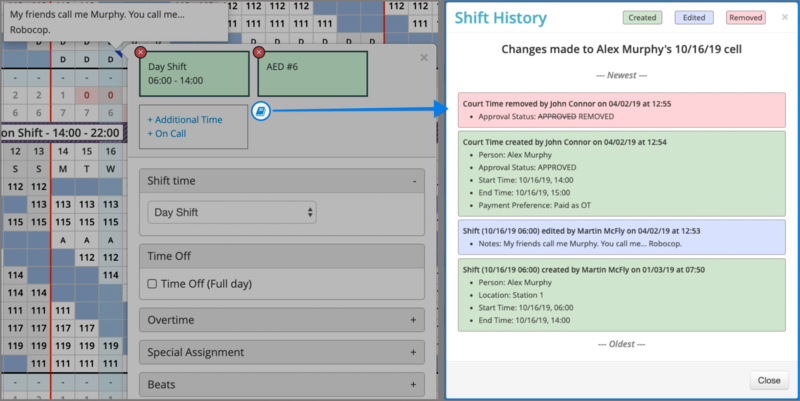 Each person at your department can access their personalized schedule with their shifts, beats and inventory assignments. They also have access to their benefit time banks and payroll time sheets. Coming soon: Google Calendar export, Mobile App access. Display and manage your schedule in a spreadsheet-like grid, or a typical monthly calendar. Completely customizable codes to label your shifts, overtimes and time offs. Each format comes with its share of goodies, like typing directly into the grid or drag-n-drop shift changes on the calendar page. We will help you choose the one that suits your department best! 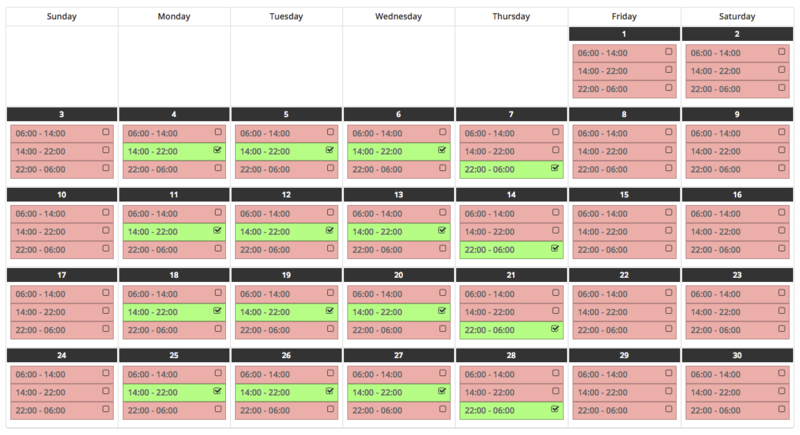 We can create your day on/off rotations and use them to quickly generate an entire year's schedule for each person. 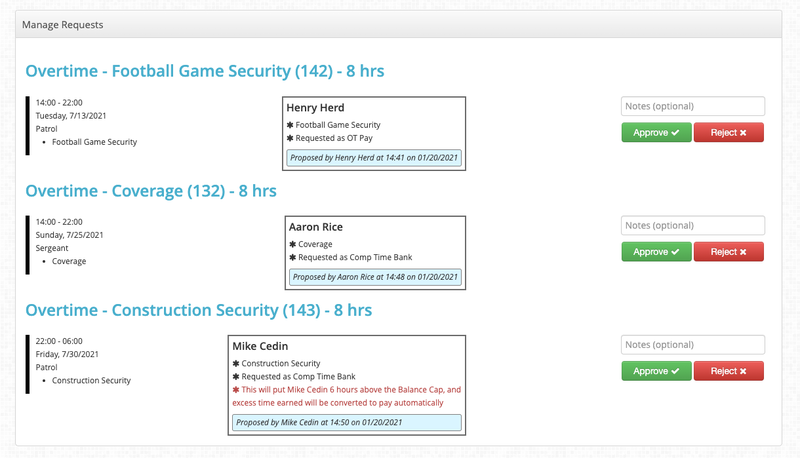 This makes day-off-groups easy to manage and scheduling an entire squad a few clicks away. 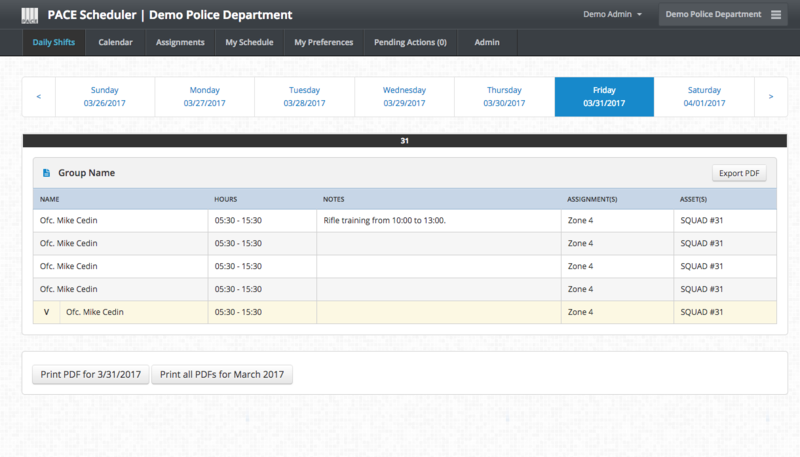 The biggest time saver the Pace Scheduler will bring to your department is without question our online request tooltip. Designed to streamline the employee process of requesting Overtime, Time Off, Special Assignments or extra shifts. 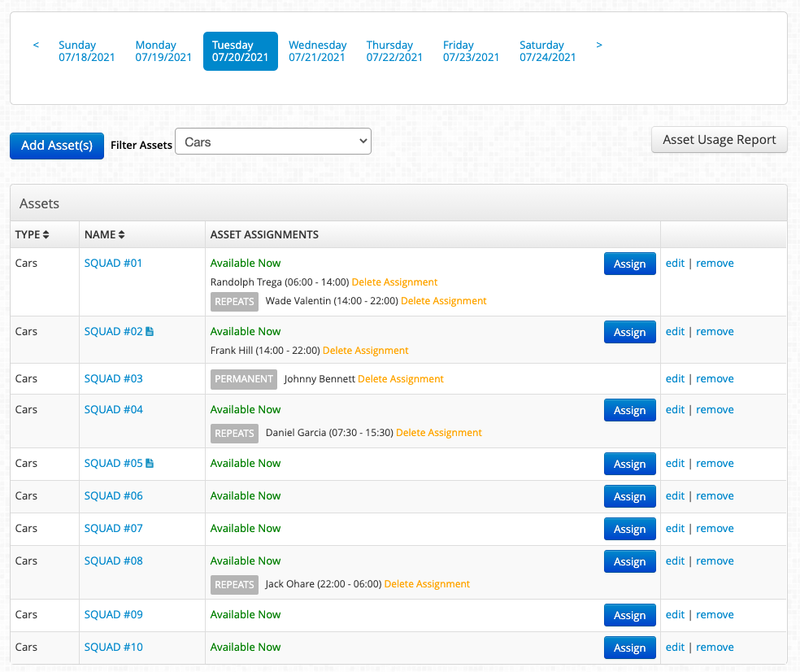 Requests are automatically sent to the correct supervisors, with our supervisor configuration system. This can tailor who is allowed to approve or reject as well as who is notified of the request. Once a supervisor makes a decision on the request, the requesting employee is notified of that choice, and any updates needed on the schedule are automatically enacted. For part-timers, collect availabilities online. Once collected, you can export these to excel to keep handy in case of changes. These availabilities can also feed directly into our Schedule Generator which, paired with your minimum staffing requirements, will attempt to fill your spots based on everyone's availability. Can be position-specific and only for a section of your department. Permanent shifts can be hard-coded for the generator to ignore or build around. Create vacant shifts directly from the calendar that everyone can see and request to work, including their preferred method of payment. 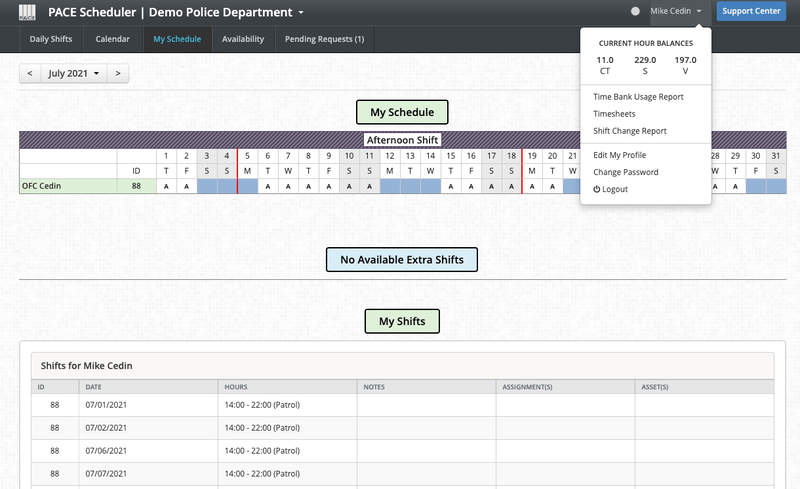 You can then automatically notify your department, via email and text, that those shifts are available. 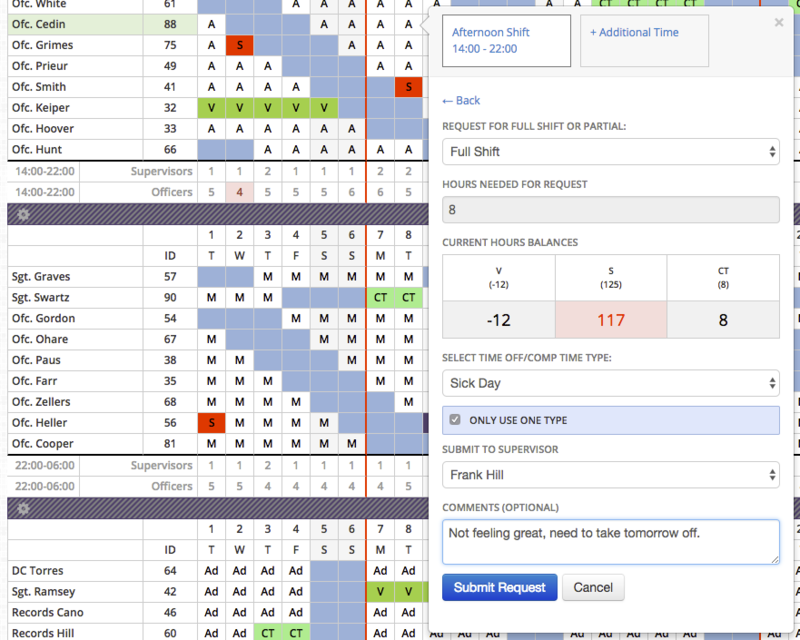 As users submit requests for those OT shifts, you (as a supervisor) will see all of these requests grouped together and in seniority order. 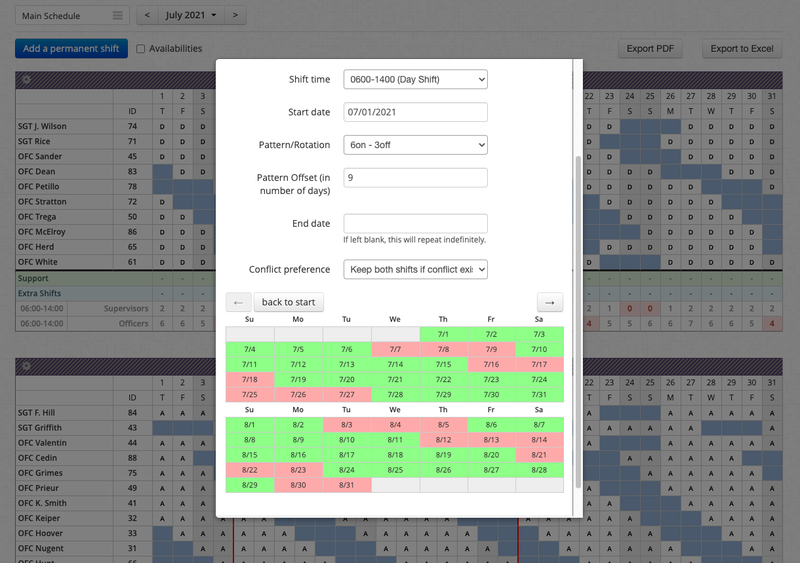 You can even pull-up a list of OT information such as: How many OT hours each person has already worked, The most recent date each person worked OT, How many OT shifts each person has worked in general, among other things. Finally, you can then approve the people you want to award the OT shift(s) to and reject the rest. This works great when you have say 5 people all requesting to work a single OT shift. Create staffing level requirements that the system will automatically monitor for you. Staffing counts update immediately as you add/remove items on the schedule, and even trigger alerts you when you are understaffed, including pre-emptive warnings on requests themselves. You also have the ability to create one-off staffing level requirements for those days where you need unique levels of coverage, such as holidays, parades, etc. Quickly see who is contributing to that staffing level and when, right from the calendar. You can round these counts up or down, or even allow them to go into decimals, to give you highly-specific partial coverage levels. Manage more than your schedule! 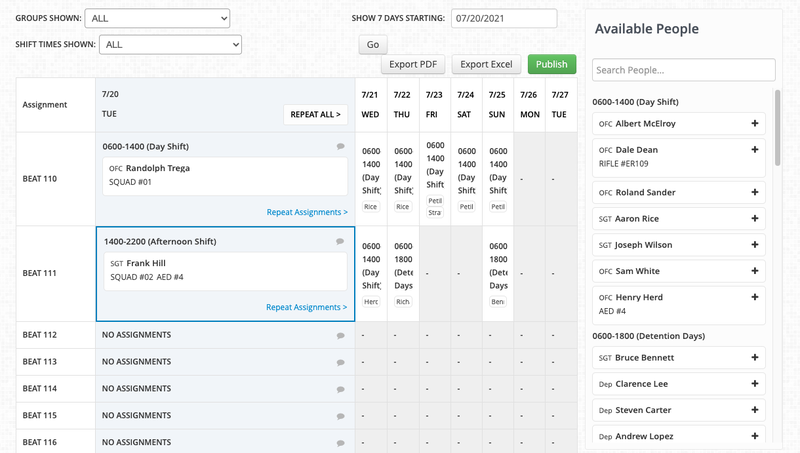 A few extra features beyond scheduling are available to you on the Pace Scheduler to help you manage inventory, benefit time and beat assignments. These are included at no extra cost and are easy to enable/disable following your needs. Set up your time banks to automatically accrue according to your union contracts with employee-specific rates. Overtimes can be set up to automatically deposit time-earned into a specific time bank of your choosing. Time-Off types can also be linked to time banks, so that they withdraw the appropriate hours when being used. 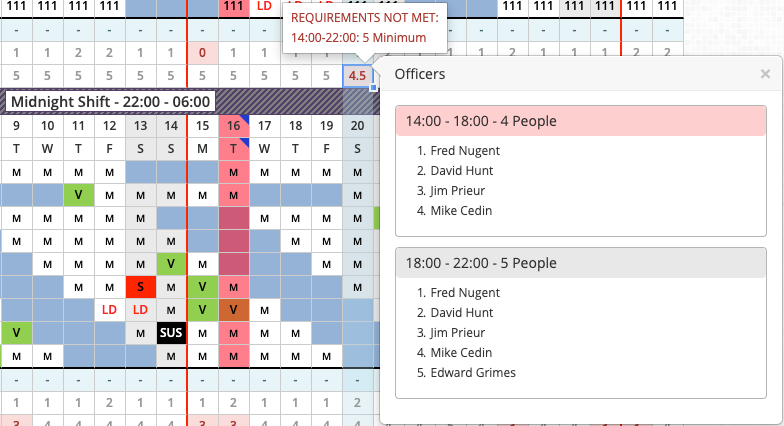 With a schedule in place, Pace Scheduler allows you to assign those resources (your valued employees) to the posts/beats/areas where they will work. 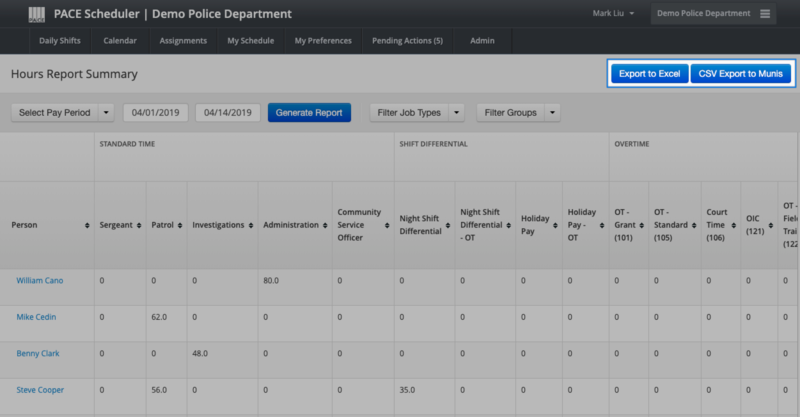 Our assignments tab is modeled after a supervisor's roll call process, showing you the people available for assignment on any particular day or shift. It can also serve as the place where you assign those same employees certain assets like squad cars, keys, rifles, AED devices, etc. The more you track here, the more our reporting shines. Track every piece of inventory that you wish to get a usage report on. This report includes who it was assigned to, when, and what beat they took it on. As with the other features on this page, this is yet another item that completes the picture of what goes on at your department. As we said before, by using the features of Pace Scheduler, you are painting a gradually more complete picture of what's happening at your department. Pace Scheduler makes it easy to translate this picture into the reports you need for payroll and better understanding your department. All reports are exportable to Excel, some to PDF. Our Hours Report brings you an accurate totaling of hours, specific to the minute for each employee. 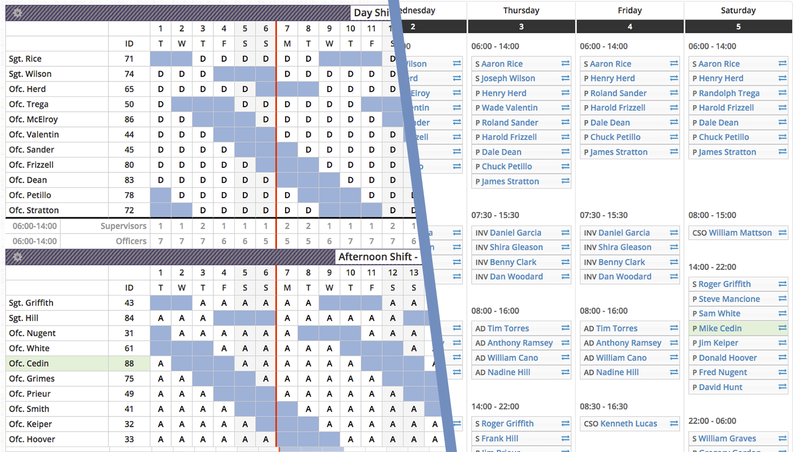 Each item tracked on the schedule gets its own column making it easy for you to see where time is spent. As soon as a change is made to the schedule, the reports are updated. 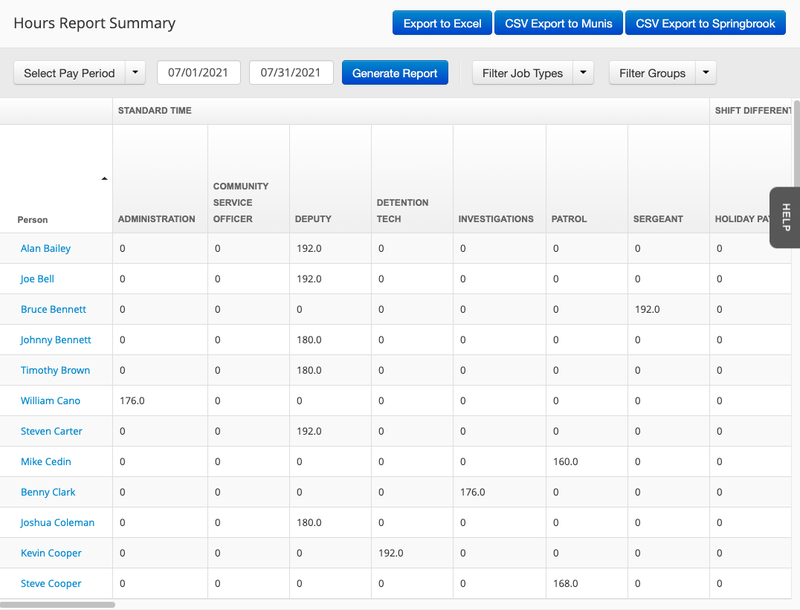 Each time you generate the report, Pace Scheduler uses your latest schedule data to tally up the hours. This report is there to represent a single pay-period for each employee. 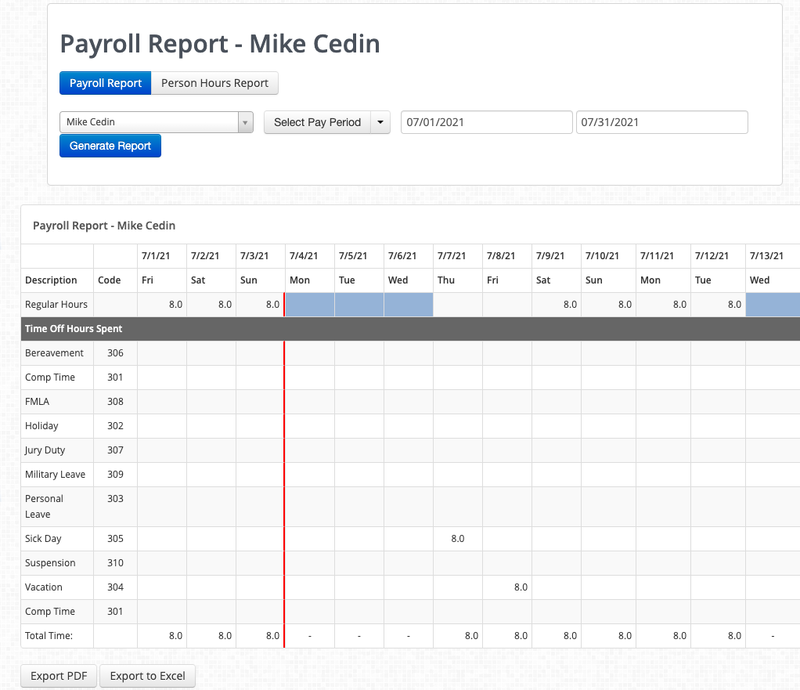 The employees have access to their own payroll report. This can be exported to PDF and Excel. Administrators also have the ability to export the entire department at once in this format, useful when the pay-period comes to a close. As changes are made to the schedule, they are all logged on your site, allowing you to view the complete history for someone's day. This includes what each change was, who made them, and when they were made. There are even filterable audit trails at your disposal, allowing you to zero-in on precisely how each person, group, or the department as a whole is utilizing the schedule. If your department utilizes payroll software in their workflow, we can create custom exports tailored specifically to your software. We've created custom exports for Munis, Abila, Paychex, ADP, BS&A, NOVAtime, and many more. Just put us in touch with your payroll system expert and we will work with him or her to create it for you so that it's available at the click of a button. The Pace Scheduler team is there to assist when you need. We have an open email line of communication with all our clients and are available by phone as well. Improvements and new features added to the platform usually come from client feedback. We are always curious in your ideas on how to make a process simpler, and are quick to make changes or additions to our platform. Make the switch to Pace Scheduler! © 2019 Pace Systems Inc.